When the thermometer drops into the single digits and we keep the house temps on the chilly side to help save energy, I'm sometimes stuck with cold feet in bed. I don't know about you, but if my feet are cold, I have an awfully hard time falling asleep. If my husband comes to bed after I do, I can't always cheat and warm my feet up on him. 🙂 Since I figured others might be in the same boat, I made up this list of winter foot warming ideas to help you keep your feet toasty, too. Yes, sometimes I go to bed with socks on. Recently, I've been wearing socks in conjunction with using Herbalix detox deodorant on my feet, so I've been sticking to cotton, but wool and other natural fibers like alpaca or even silk are great for keeping in the heat. Make sure your socks are loose enough to be comfortable. Don't restrict blood flow, as decreased blood circulation cools you down. Before bedtime, I sometimes layer socks and slippers, to make sure my toes are toasty *before* I jump into bed. It's so much easier to keep your feet warm than to try and warm up feet that are already cold. Cost – Around $15 for Heat Holders women's socks, around $10 for a two pack of wool socks, electrically heated booties – around $50. My first microwavable hot pack was given to me by a friend of mine who works for Core Products of northwest Wisconsin. The first winter I tried it I fell in love – and ordered more. The packs are filled with a non-toxic, biodegradable gel, and are heated briefly in the microwave. They have a soft cover to make them comfy against your skin. Once heated, they stay warm all night. I warm mine up, stick it in bed while I go brush my teeth and get my jammies on, and slip under the covers to a toasty foot reception. Aaaaaah! Targeted heat without cords. Core Products makes all their products in the USA. Cost: The 10×13 inch CorPak Soft Comfort Hot & Cold pad is a little over $10. My sis has a heated mattress pad that she swears by when winter hits. Before bedtime, she preheats the bed, then shuts it off and climbs into a warm and cozy nest. This minimizes her electricity costs and her exposure to EMFs. My husband's grandmother was a huge fan of electric blankets. She had more than enough for every bed in the house. Either option concentrates the heat where you need it – on you. Team heating pads up with a programmable thermostat, and you can drop the temp 5 or more degrees at night and still wake up to a warm enough house to shower in the morning. It takes a lot less energy to heat one or more beds than to heat an entire house. Cost: Full sized heated mattress pads start at around $50, plushy king sized pads can be around $150. Oldie but a goodies, these heat providers don't need a microwave or electricity. New hot water bottles are less likely to leak than older models, and many come with easy to use covers (although you could use a pillowcase in a pinch, or sew your own). Fill your bottle with very warm – not boiling – water, and use in a manner similar to the hot packs. These will not retain heat quite a long but are likely to be more than enough to help you fall comfortably asleep. Cost – Around $10 for a water bottle with two funky slipcovers or a basic rubber bottle with no slip cover. Heat clean bricks near a wood stove and cover them with something soft, such as an old, thick sock. Don't overheat – you should be able to handle it barehanded. You don't want to burn your feet, just warm them up. Everyone knows massages help to increase blood circulation. If you pair up your message with a bit of spice, the effect lasts longer. Sprinkle a bit of ginger or cayenne into your favorite oil (such as coconut or olive oil) and mix well. Rub this mixture into your feet before bedtime. A little goes a long way, so don't overdo it. Allow oils to soak in, and cover with cotton socks to absorb any excess oil. If you're not sure about spicing your feet, warm your whole body by sipping some ginger tea. Cost: varies, depending on your herbs and oils. Please share if you find this post useful, and stay warm! Originally posted in 2013, last updated in 2018. You can also fill fabric rectangles up with rice or flax seed, sew it shut, and when you want it hot, microwave it for one and a half to two minutes for one that’s 6 inches wide, and a foot long. They make great heating bags for your back or shoulder, but one kept in the freezer will give a nice cold compress that doesn’t ‘sweat’. We keep one in the freezer and one in the closet. You can make them smaller for foreheads too. Thanks, Debbie. Another friend of mine says she has one filled with corn, too. Yikes! I can only imagine what happens when you microwave a corn-filled heating pad, LoL. My feet are saved by Mr Woolly Socks. I found them by chance on line. I have been wearing them for bed for two years now and cannot imagine going to sleep without them. I have always had trouble with cold feet! Before I got married to my wonderful husband who also lets me warm up my feet against him, (what a blessing he is!) 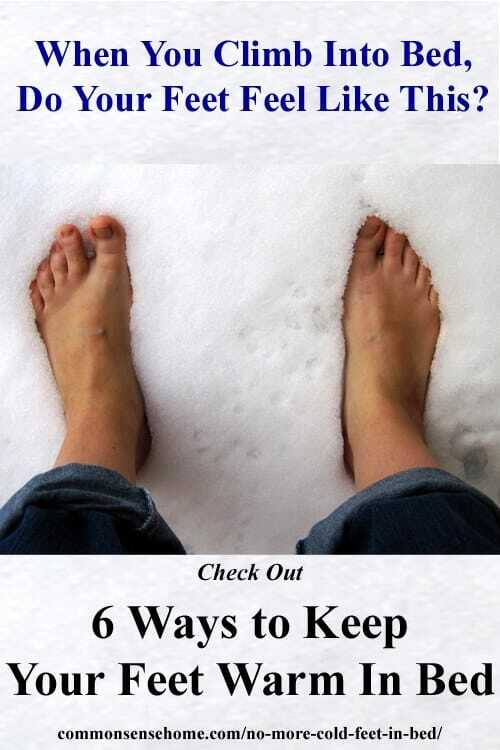 I have been known to try at least 3 or 4 of the methods you mentioned here 🙂 Thanks for sharing – hopefully it can help more chronic cold feet-ers! This one is free, easy, lasts all night with no electricity. Jyst run a coupke of really soft bath towels in your dryer til heated tgrough and toss ggem in bed ahead of you. When you get in you can snuggle your feet into them ir wrap against a sore joint. Cotton retains the heat amazingly. Excellent if you have one of those nasty cold temperpedic mattresses. I love heavy weight flannel sheets; although, even the lighter weight flannel, to me, is better than cold cotton sheets in the winter. The bed is never chilly. This next suggestion is probably going to sound very strange…lay an emergency blanket (reflective side up, of course) underneath a mattress pad—it keeps the crinkle sound to a minimum—and then top with a fitted sheet. Years later……….. isn’t it great that helpful hints are always helpful. When it gets colder – just beginning to now- Oct 2015 – I am going to put an emergency blanket under my fitted sheet (flannel or one of those T-shirt material sheets they have now). And I usually always wear socks – around the house & in bed & stay bundled up when not in bed. That’s what you do when you live in an older house & keep the temp low. Ok, i know you are not going to feel sorry for me at all, but i too have cold feet….all the time….in Florida. 🙁 lolol. Well not all the time, but a lot. I just ordered some of those core products, thanks. It happens. I finally got the bed all warm last night, and then my hubby showed up and this time he had the icy feet. I graciously shared the hotpack along with a snuggle, and before long we were both warm. Not looking forward to winter, but glad he’ll be home every night. We switched to sheet blankets and they are a lot warmer then cotton sheets. Sheet blankets? Is that the same as flannel sheets? Great ideas Laurie! I use flannel sheets, slipper socks and a couple of thick quilts and we also turn our thermostat down at night to save energy just like our grandparents. I LOVE all of these tips! Thank you so much for sharing! I read your emails all the time and never make a comment, so I thought today I would tell you how many changes I have made in my life from your articles! Thank you and keep them coming! Thanks, Dawn. It’s so nice to hear from people who are happy instead of the grumpy people. Hi Laurie! I’m one of those husband’s who get’s a cold shock when my wife presses her cold feet into my back to warm them up in bed! We started thinking about better ways to help solve the “cold feet in bed” issue and came up with a little product called Cozy Toesies. I’d love to get a sample to you so you can give it a try, if you’re interested. Let me know & thanks in advance. I’m not sure it would work on our bed, because we have a crazy tall mattress. We ordered it from a local bedding manufacturer and had it made double sided so it could be flipped and last longer, but when it showed up it was much thicker than we anticipated. One method I didn’t see in the post or the comments is what I would call the Infantry method – wear a hat. I have heard this one from lots of armed forces guys. Even when you have to get into the sleeping bag with your boots on, your feet can get cold at night. Wearing a beanie or other kind of winter hat traps the heat, and your head is usually the only thing sticking out of the covers at night to lose that heat. Trap it with a hat and your feet will get warm and stay warm. When I was breastfeeding my second child, I read in of my new mother booklets that Raynaud’s (ray-NOHZ) disease, phenomenon or syndrome causes some areas of your body — such as your fingers and toes — to feel numb and cold in response to cold temperatures or stress. I believe that why my hands and feet are always cold in the winter. Thanks for the great ideas! My feet are normally warm when I go to bed because I have two fluffy yorkies who manage to work their way to the bottom of the covers around my feet and behind my legs. It’s when I’m sitting at the computer when I’m cold. I have a warm blanket under my desk and I fill up two 2-liter soda bottles with hot water, dry them off, then put them on top and under the blanket under my desk. It works wonders–until the bottles cool down. My mom used to fill a long sports sock with rice and tie it at the end then heat it up in the microwave. She would put them in her jacket pockets when feeding the animals, too. My husband has allergies, so no critters in the bed. The soda bottle idea is a good one, for short term heat at least. I’m still trying to train the cats to lay on my feet. I keep a blo-dryer by the bed, since it is just me feet that get so cold! When they are too cold to fall asleep, Ireach under the covers and zap both my feet and the covers above and below them. It lasts long enough to fall asleep and then they stay warm! Vicks on your feet! Wool socks (not too snug) over top. Warms up the feet and clears a stuffy head (if needed). Handknit socks warm me twice–while knitting them and I wear them to bed. The sock yarn is a blend of wool and nylon so it really does the job. I also have put rice in old socks and tied them around the top tightly; they can be kept in the freezer for bumps and sprains and can be heated in the microwave when heat is needed. Either of these are so much better than buying the latest thing at the store,. I sleep warm, if that makes sense. I can’t use a heated mattress pad or electric blanket because I’ll get too warm. My cold feet solution came off a clearance rack last summer… It’s an electric fleece throw blanket. The beauty of that throw is that it automatically turns off after 15-20 minutes which is long enough to warm my feet & then fall asleep. Some heating pads are the same, with an auto off function.